On a breezy Wednesday evening, after a long afternoon at the beach, A and I decided to get a quick dinner somewhere nearby on Sanur’s main street, Jalan Danau Tamblingan. Since the summer season has officially begun and the yearly tourists have arrived on the island, most of the restaurants were packed, including our local cafe and last resort dinner destination Cafe Batujimbar, so we drove up and down the street looking for a place that wasn’t packed. Finally, we parked at Hardy’s and ended up at the ramen house that used to be inside Hardy’s and has recently moved across the street. 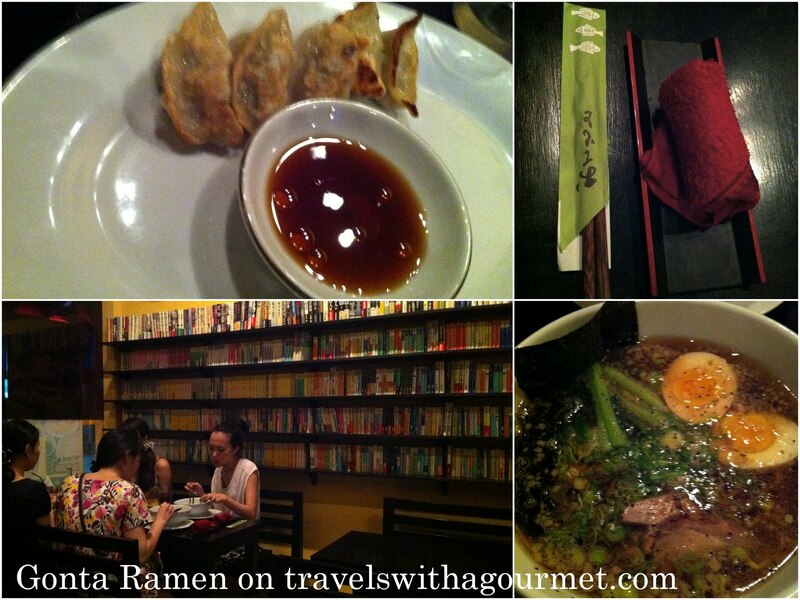 Gonta Ramen is a tiny noodle counter with a few benches and tables squeezed into a cozy space lined with bookshelves filled with Japanese comics and reading material. There is a small counter at the far end where the open kitchen is and where solo diners usually sit. The menu is limited and only has ramen in several forms (different types of broth and types of noodles) and a few simple dishes. We had been to Gonta a few times before and also once to their newer, bigger open-air restaurant further up the road on Jalan Danau Poso. As before we had the shoyu ramen set which comes with a side order of gyoza (pan-fried dumplings), a bargain at 72000 IDR (about US$8.50). The food came quickly – a large steaming bowl of tasty broth filled with noodles, a hard-boiled egg, greens and slices of roast pork. The accompanying four pieces of gyoza were crisp on the outside and filled with the usual ground pork and vegetables. It was a delicious, simple and filling dinner and a Bali bargain. This is the second post I’ve read today about noodles (I’m having to go through about 150post to catch up on the blogs I follow) and it’s really making me want ramen! *tummy growl* I have no right of course after gaining 4kg in 3 weeks hehe. Blame it on Bali!